Couple of years ago I used to buy a lot from second-hand shops, but now it has become a cliché. I also now think it is worth investing in more expensive clothes and accessories. I try not to follow anyone’s style. Obvious is that you get ideas from fashion magazines, but travelling is also one thing that really affects my style. 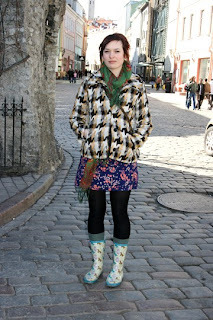 I think Estonian street style is becoming more and more like it is in Europe and this is, of course, positive. I personally think of my style as Britpop. I frequently read GQ for ideas and I admire Jude Law’s style. My style is pretty and child-like. I like flowers and wearing colourful clothes, especially red. Music plays quite large role in my style. I think bands like Bat For Lashes and The Knife are very inspiring Most of my clothes come from charity shops in England. My style is entirely inspired by music and films, for example “Lords of Dogtown”. I get my clothes from here and there, but nowhere special. 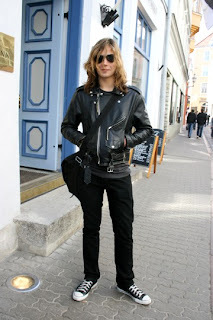 I think Estonian street style is really OK. In other countries there are too many fashion victims. As I work as a stylist I really like mixing high street with high fashion. Never buy a complete outfit from a shop, because it is so dull and so obvious. In Estonia many tend to do that with clothes from Zara. I really admire Kate Moss for looking cool in everything. She makes even wellies look like haute couture. I like browsing different style blogs, because you can get so many ideas from there. I also read fashion magazines like Vogue and Elle, but I make my own clothes. In spring I want to wear colours like green, red and pink. 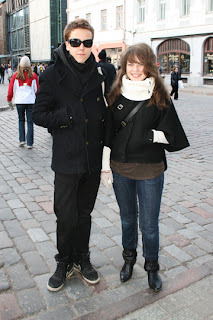 In winter like many other Estonians, I went through a dark phase. As I have been involved in fashion business, I see people as walking “pieces of art”. At the moment I am pregnant and my style is strongly influenced by feeling comfortable, yet looking colourful and happy. I admire Anu Samarüütel’s and Jennifer Lopez’ style. I don’t care what is ‘in’ this season or next- I want to develop my own personal look. Now and then I flip through fashion magazines, but just for ideas and details. I usually shop in second-hands and I feel as I am influenced by Jimi Hendrix’ style. My style is very very positive. I buy most of clothes from Estonia and I really like Fornarina. I buy only these clothes I really desire. It is not worth buying something just for buying – you really have to want them. I love Gwen Stefani's style. 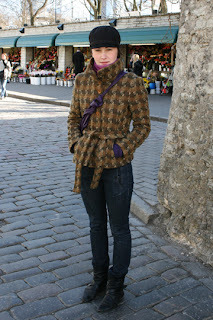 Annika: My style is affected by the whole Soviet era and especially by clothes from the times of Olympic Games in 1980. I really like red, too! In order to get such clothes I shop a lot at second-hands. Liis: All my clothes need to have quirky twists. I don’t want my clothes to be too normal. Good place to shop is Jõgeva with cool second-hands. When I am in a mood, I make clothes e.g. this scarf. Ester: I read British Vogue for ideas, but I am also inspired by shopping at second-hands. 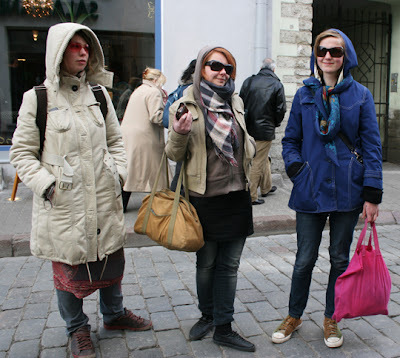 In Estonia you sort of have to shop at Zara or second-hands if you want to look stylish. I buy clothes that have that ’something’ inside them. Ingmar: I agree with Ester about shopping at Zara, but I also like shopping abroad, even at likes of H&M. My favourite designer is Viktor&Rolf, but you cannot get their clothes from Estonia. In Estonia there aren’talso many fashion magazines for men, so if I need ideas I browse Italian L’uomo Vogue. Style comes from inside and therefore I don’t have anything special that inspires me. I really like Miss Sixty and I often shop at Zara or wear my mother’s vintage clothes. 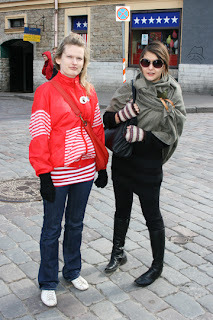 Unfortunately too many Estonians wear awful clothes. I can simply hope that the streetstyle will get better! My style is bit feminine. I make my own clothes or shop abroad- I don’t want to walk down the street and see someone who is looking exactly like me! This year I am planning to experiment with shorts and miniskirts. I have rarely worn them, but now I feel like it. Helmi: I love the 20’s style, unfortunately I don’t have many opportunities to wear that. I think we all like art and this probably affects our styles also.Very cool designer is Vivienne Westwood. Helen: At the moment I like the 80’s. There were so many quirky styles and clothes back then. I also dig Vanilla Ice and other rappers, they are pretty cool. 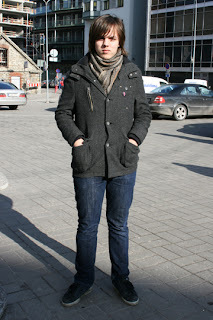 Pire: Good thing about streetstyle is that it mixes so many different subcultures.This makes it so unique. I think Orient as a whole is very inspiring. There are some cool designers who take kimonos and make them into actually wearable dresses. Life is too short to worry about what you should wear or not. I like being colourful and I want my clothes to reflect how I feel. 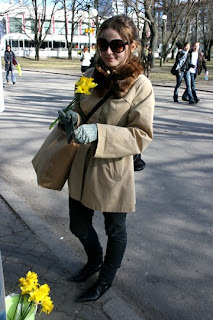 Today I am happy, because it is my friend's birthday and finally it is spring and getting warmer. I like rock'n'roll style with skinny jeans and black t-shirts. Essential part of my style is wearing sneakers. I don't understand young girls, who wear miniskirts all the time and guys who seem to have only tracksuits.